First things first… consult your inspiration. Notice I didn’t say gather inspiration because ideally you’ve already been doing that whether its through endless pinterest boards or Instagram collections. When you aren’t sure what you want to make, its difficult to search for inspiration as you don’t even know what you are looking for. But if you’ve been piling up inspiration all these years you’ve got to let it do it’s job and actually consult that resource! I personally use pinterest as my library of inspiration. I have boards for each type of garment where I save patterns I love, and I also have a board called “sewing inspiration” for things that inspire me creatively but aren’t actual patterns. This fabric is 100% rayon with a beautiful matte finish and amazing drape. 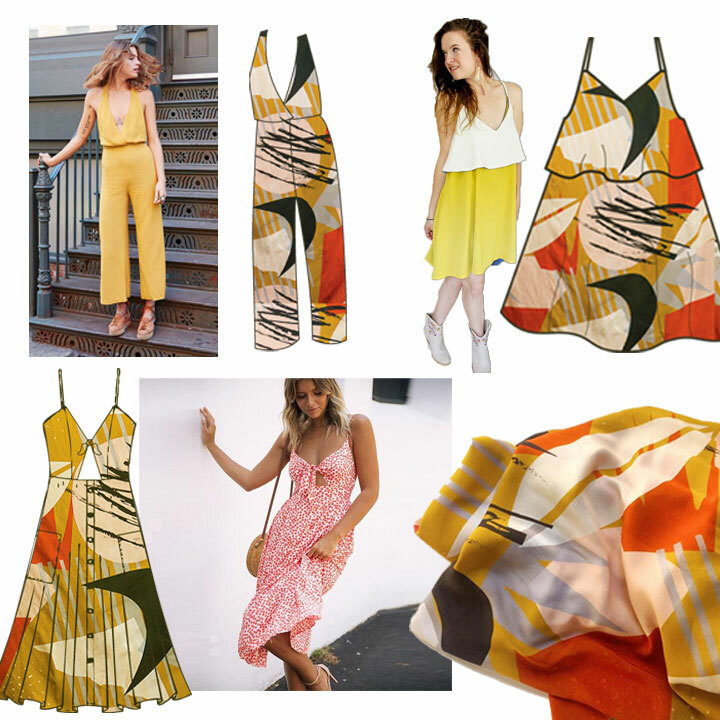 It is also a large-scale print that I have two yards of, so I immediately knew I was looking for a full bodied garment as opposed to a simple top. This print needs to shine!! I started by browsing my dress board noting patterns that I think could work. Next I went through my sewing inspiration board for silhouettes that I think would look amazing in this fabric and started thinking about patterns I could use or hack to achieve the same look. All the while I have the fabric in my hands so I can look back and forth at the images, hold it up, move it in my hands, and really try to make a connection between the fabric and the photos. My very first thought was to do a two tiered Roksi Trio using the crop and dress layer. This came to mind because the lines of the Roksi are so simple, and it has great swing. Two things that will allow both the print and the drape of the fabric to really take center stage. I’ve also been really loving those tie front dresses with button down skirts and I’d love to hack the Jessica dress by Mimi G to get this look. The skirt is gathered so I’d get great use out of the fabric. Lastly, my husband suggested a jumpsuit. I think for this print I’d have to stick with something with super clean lines. I like the one pictured here but something like the Olive Jumper from Untitled Thoughts could work really well too. Next I used illustrator to copy a picture of the print, turn it into a pattern swatch, and use it to fill the flat sketches of each garment. This takes a little bit of time, but if you have the skills it can REALLY help to visualize the fabric in each garment. If you aren’t proficient in illustrator don’t worry, there are a couple alternatives here! I also sometimes simply sketch out the garments on paper and color in a loose depiction of the print the old fashioned way. You could also print out the scan of the swatch or image of the fabric and draw your line drawing directly onto the print then cut it out. When going this route you really want to make sure you are printing the swatch at a scale that makes sense for the garment. This stage always helps me figure out a clear winner… which one do you think I’ve chosen?? Start with the weight of the fabric. Narrow down your patterns from there. Lightweight fabrics will be best for tops and lined dresses. Medium to heavy weight fabrics will be better for bottoms or outerwear. And of course if your fabric is a knit that really narrows it down! Play with the fabric in your hands, hold it up to your body, and think about the best use for it. Narrow it down even further based on the drape of the fabric. Stiffer fabrics will work better with structured & tailored patterns. More drape-y fabrics will work better with flowy tops, dresses, or even pants. Think about how the garment is meant to move. Next look at the color & print. Is it a color you want close to your face? If not maybe it would be better as bottoms. Is the scale of the print small or large? Is this a print you want covering your entire body at once? Is it busy or simple? Or perhaps its a solid? Patterns with a lot of detail and style lines lend better to solid fabrics where those details can really shine. Busier prints can really help a simple pattern stand out. Lastly do a mock-up of some sort if you can once you’ve narrowed it down to less than five choices. 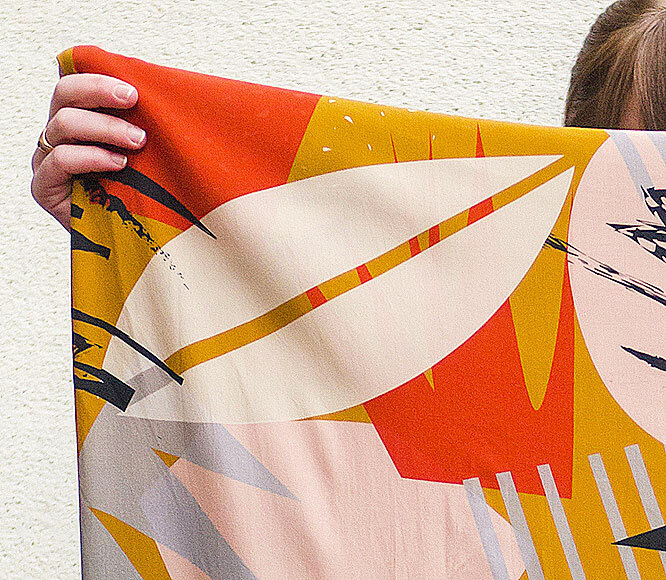 This will really help you visualize your new garment in your amazing fabric. 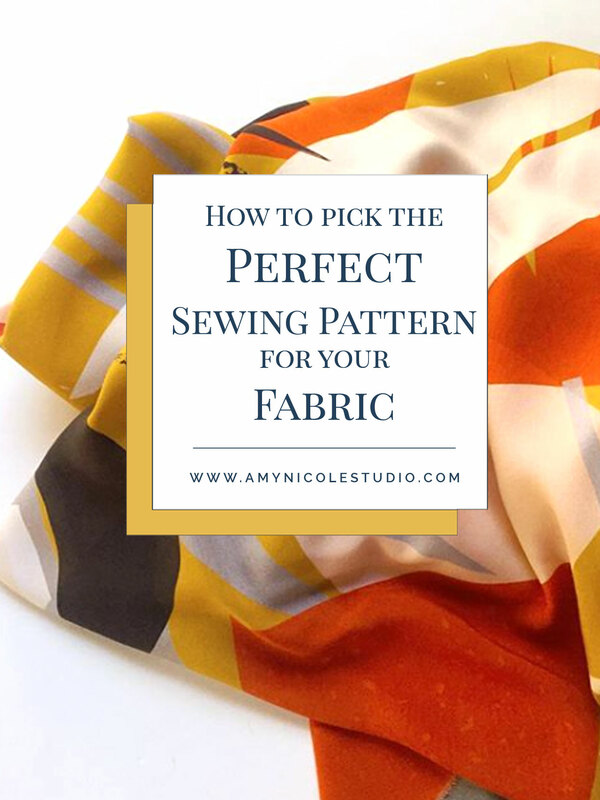 I hope I’ve given you some clarity when it comes to finding the perfect pattern to use with your new fabric. Stay tuned next week or follow me on instagram to see what I’ve decided to make with mine!! All helpful tips, thank you! I really should spend some time on a simple mock-up. So often I let myself get swept up in the moment of obsessing after and sewing a particular garment that I don’t really stop and think how it would look on my body. It would force me to slow down and be more intentional about the garments I make. My guess is you’ve decided on the jumper!